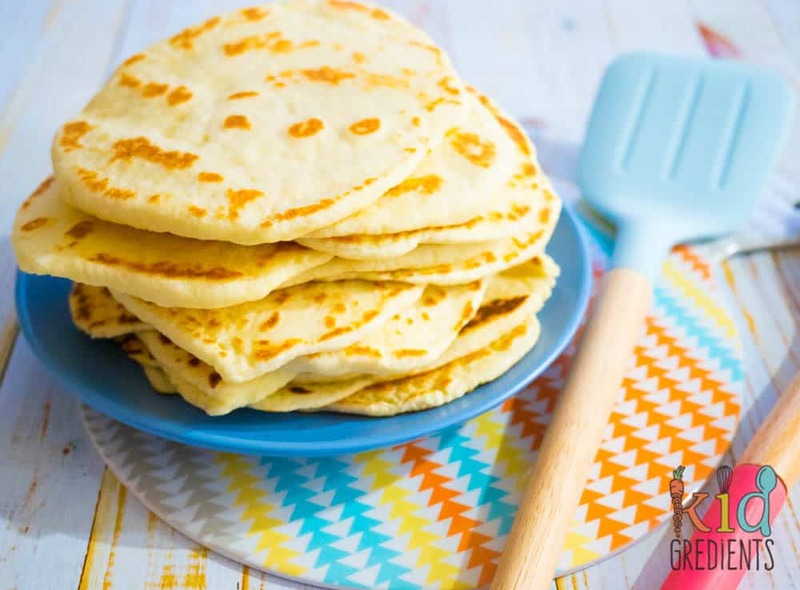 You are here: Home / Recipes / Basics at Home / Super easy 3 ingredient flatbreads, no rising! 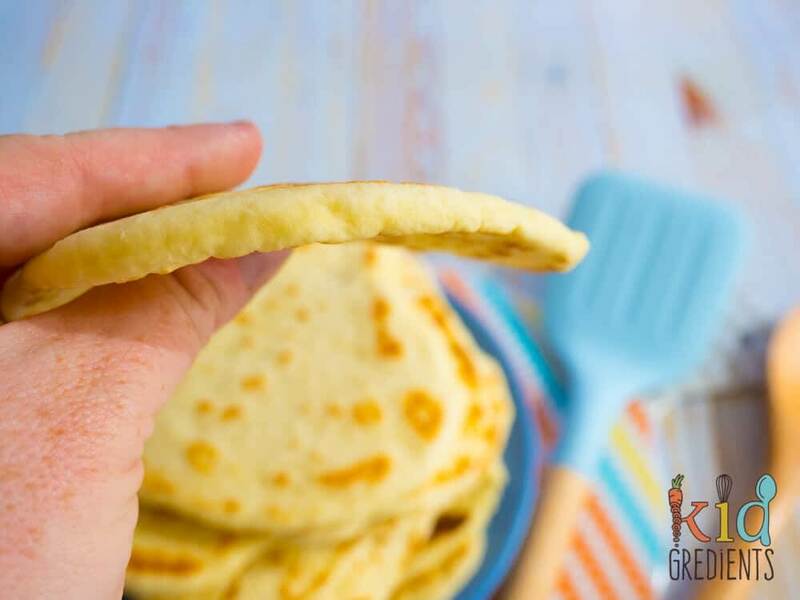 Super easy 3 ingredient flatbreads, no rising! Flatbreads. They are literally my lifesaver. 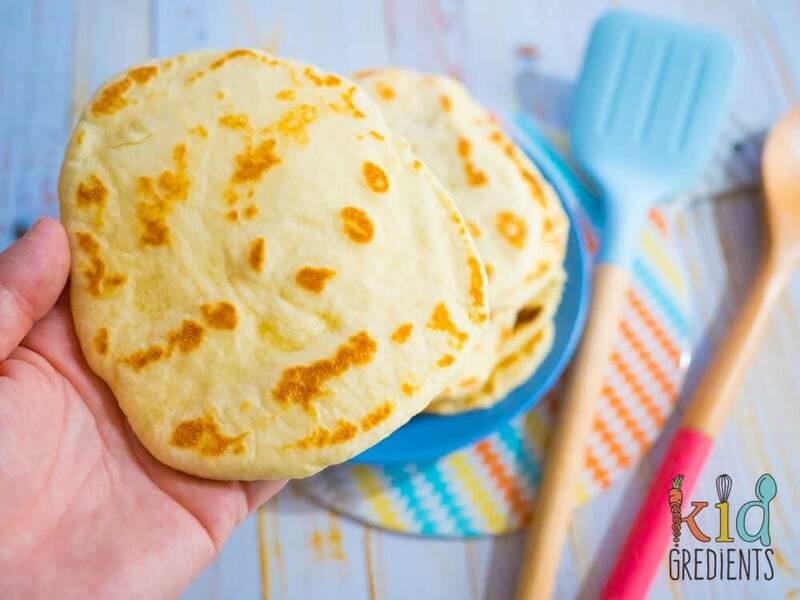 And these super easy 3 ingredient flatbreads probably use stuff you already have in the fridge and pantry! They will mean you can always have a yummy side ready for your next curry or dip and that you never run out of yummy stuff for the kids lunchboxes. If you’ve always thought making bread was too hard, you will love these, no rising, easy mixing and only 3 ingredients! But they also don’t go hard and have an awesome flavour. Actually, once you have read this recipe, there’s no excuse for not making your own flatbreads! The rolling can be done by the kids and the ingredients are things you probably already have. We eat them with mango chicken or other curries, I chop them up to pop in lunchboxes and they are a staple, so I thought it was about time I blogged them. As an aside, I want to talk about Olive Oil. A lot of people think that your olive oil has to come from Italy, Spain or Greece to be any good. But by thinking that, we are stopping ourselves from having some of the best olive oil we can find- Aussie olive oil! It’s so good that it’s all I buy, for many reasons, less food miles, much fresher, better taste, and supporting Aussie farmers. Sorry, that’s just me- bee in a bonnet about olive oil on a Monday! Self-raising flour is just plain flour with baking powder added into it, so if you don’t have any, it’s two teaspoons per cup of plain flour. You can also make these healthier with wholemeal instead of plain white flour, but it also makes them much denser, so they won’t have the light fluffy texture these ones have. If you want them to be similar to store-bought naan bread, brush with melted butter and garlic before serving. After making store in an airtight container in the fridge or freeze on a tray and transfer to a container when solid. Defrost overnight in the fridge or just put them on the bench while you prepare the rest of lunch and they will be ready to use. 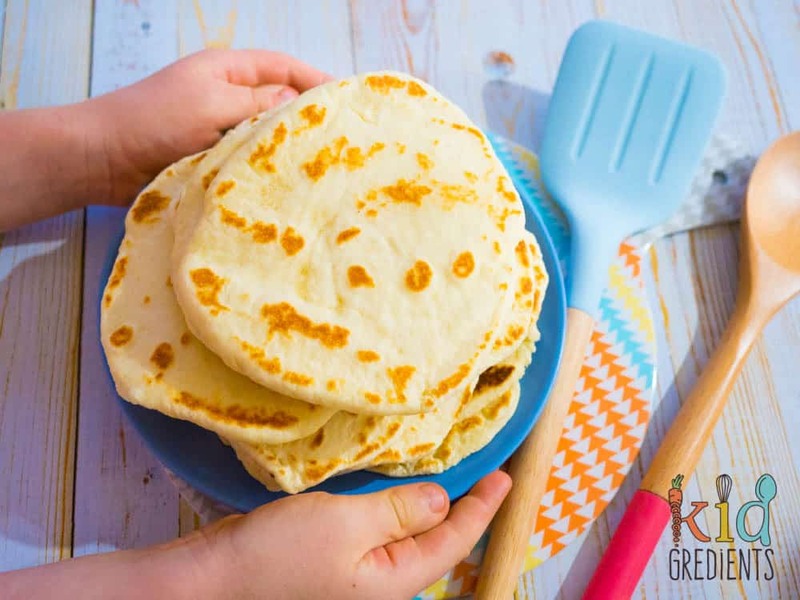 3 ingredient flatbreads, so easy to make, freezer friendly and kid friendly! No rising, no waiting, no baking just quick and simple! Combine all the ingredients in a large bowl and mix either by hand or with a mixer until an elastic dough forms. Divide the dough into 16 pieces, then roll each out into a circle around .5m thick. Heat a frypan over medium/high heat. Sling the flatbread onto the frypan surface. Repeat until they are all done. Previous Post: « Banana smoothie cupcakes, no added sugar! I’ve just made these again … they’re always popular. This time I added a pinch of salt and the ground seeds of five cardamon pods and was surprised how much in enhanced the flavour. Is it possible to freeze in dough form? You can but personally, the dough is so easy to make that they are better frozen when they have been completed. The easiest step is making the dough. Why were mine a complete disaster? I halved the recipe and went off the gram amounts, not the cups but they were so sticky they were unworkable. I ended up adding at least an extra cup of flour and losing most of the mixture to my hands. I couldn’t make them into rounds as they just kept falling apart and if I tried to do it on a surface they would just stick. I can’t see how I went wrong if it’s been so easy and worked for everyone else? I make these at least once a month and have never had this problem. But you did halve the recipe, and I’ve never attempted that, in fact, it took me a long time to come up with the exact right amount of each ingredient, so I wouldn’t halve it! Is it possible to use rice bran oil instead of olive oil? Many thanks! Can’t wait to try! Yes, you could try it! Great recipe! Super easy and simple. I jazzed mine up as mini garlic pizzas and cooking it with a generous dollop of butter for flavour. We will serve these up as mini bruchettas for our little toddlers lunch tomorrow! Any suggestion how can I make it vegan? Hi Ka, sorry, I’m not really sure how you could make them vegan! Can I use fruit yoghurt for a sweet pancake like bread? I’m not 100% sure how that would turn out but by all means, give it a go! Yum! 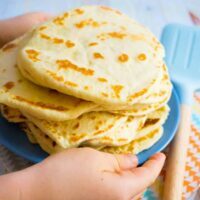 My 10 year old and i made these flat breads tonight and they were super easy and super fun to make. We filled them luke a burrito and my kids loved them! I think they will easily become a weekend favourite! Thank you for this easy and delicious recipe! Yay! So glad you enjoyed making them! Will I need to add extra liquid if i use greek yogurt? No, it will work just fine! For this recipe if I use regular flour, will I have to add 5 tsps of baking powder? Hi, do you have these measurements in grams? Thanks! Do you have suggestions for a gluten free version? not at this stage. There are loads of other flatbread recipes that are gluten free, this one isn’t by default. I know this would pretty much taste foul with supermarket gluten free flour. Sorry! 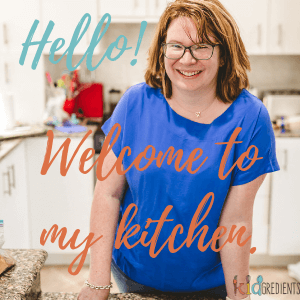 If you experiment and make it great gluten free, I’d love to see how!